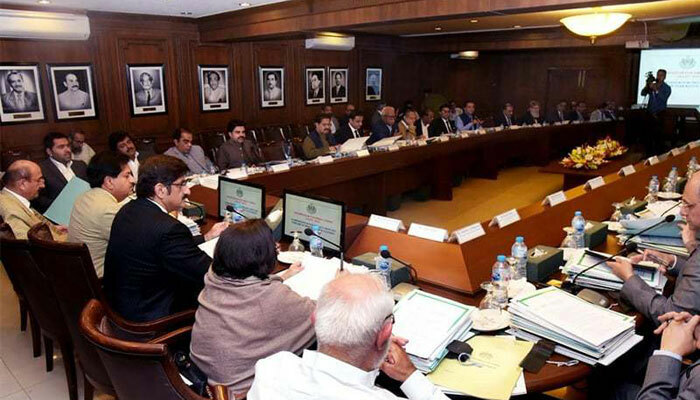 KARACHI: Sindh Chief Minister Syed Murad Ali Shah has directed all provincial departments to start process for enlistment of 41,000 employees from grade one to grade 15 against existing vacancies purely on merit and through a transparent procedure. He stated this on Monday while presiding over a meeting regarding recruitment against existing vacancies. The meeting was attended by almost all the cabinet members, Chief Secretary Mumtaz Shah, Chairman P&D Mohammad Waseem and all provincial secretaries. The chief minister said that there were 41,000 vacant position from grade one to grade 17 in different departments. He said that the recruitment of the officers would be made on local level through selection committees in which finance and S&GAD representatives would be inducted. The chief minister also directed the provincial secretaries that women and differently-abled person would have their quota in the new recruitment. The meeting decided that from Grade five to Grade 15 recruitments would be made through testing service/third party so that merit could be maintained. CM Shah directed Minister of Education Syed Sardar Shah to start recruitment of teachers through a separate process. “These recruitments of the teachers must be school-pacific so that shortage of the teachers can be met,” he said. The education minister, Syed Sardar Shah assured the chief minister that teachers recruitment would be completed during summer vacation. It may be noted that the teacher’s positions are separate from the existing 41,000 vacant positions. Minister Health Dr Azra Fazal Pechuho pointed out shortage of doctors and said that a requisition of 1700 doctors have been made to Sindh Public Service Commission for selection. The chief minister said that the doctors could be appointed on hospital-specific basis through walk-in interview on contract. “After six months they would be referred to SPSC for their suitability,” he said.